iDOX Document Management System is a software application that helps you to scan, store, retrieve and track your documents. Traditionally organizations used paper for everything and some businesses had to spend millions of dollars to manage and store the documents. Take the example of IRS (Internal Revenue Service) of the United States of America. IRS is a federal organization that collects taxes from citizens of United States. People have to file tax form every year and considering the population size, IRS would require huge warehouses to store these paper based documents. But that’s not the case, they scan these documents, convert them into digital form and store them on servers. This way the federal agency ends up saving time, money and space; plus the efficiency and effectiveness of operations increases immensely. So how does the iDOX DMS helps your organization become eco-friendly? The answer is simple, iDOX converts your paper based documents into digital format and stores them on your computer or server. Your organization will use less paper and will be able to recycle and reuse it thereby saving trees. With iDOX your documents are saved in digital format on the server and you can access your documents from anywhere in the world. Moreover the application is available on Web, iPad, iPhone and Android so you can simply log in to iDOX using your Smartphone and review the documents on the go. 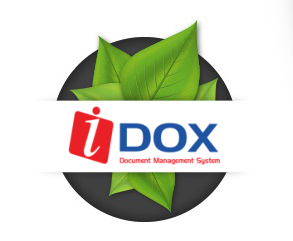 iDOX Document Management System is quite simply the easiest way to have a positive impact on the environment as a whole, recycle paper and label your organization as eco-friendly whilst fulfilling your social responsibility. iDOX Document Management System manages your documents by first getting them in digital format and then storing them on severs for later use. This eliminates any paper based documents from your organization and everything from invoices to financial reports are available in digital format. Cutting down on paper helps your organization fulfil its social responsibility and also helps you go green. With iDOX DMS you can make a positive impact on the environment while still reaping the benefits of a paperless office.